Success: What Does It Mean for PLDC? My Friend, YOU ARE WORTH IT! 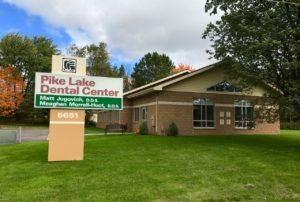 What Do You Get When You Choose Pike Lake Dental Center? Eeewww! My Splint is SMELLY! A Traditional Sleep Study for Sleep Apnea – Do You Have Another Option? Charcoal Whitening: Yay or Nay? Are Dentists Typically Pack Rats? Does Our Dental Technology Cost YOU More? Happy Holidays from the Jugovich Family! Is an Electric Toothbrush Really That Amazing? Sleep Apnea: Can An Oral Device Aid In Treatment? Because You Asked: How Long Do I Have To Wear My Orthodontic Retainer? I remember signing up for a personal Facebook account in 2008. I really only joined Facebook to keep in contact with my friends who had moved out of state. Now, I feel Facebook is a vital link for me to much more than just my out of state friends. I am able to keep up with different groups of people (family, school friends, work friends, neighbors, etc. ), sell things, creep on people’s profiles, watch funny videos and support causes. I can show my support or love for a post or react with laughter or anger. Friendships can be formed, fostered or destroyed on Facebook. Facebook is a powerful personal tool, but how can it help a business? More specifically, how can Facebook impact a dental office? 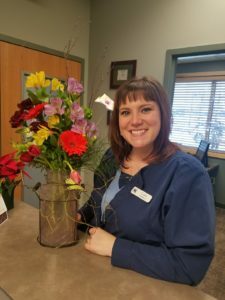 When I officially came back to work at Pike Lake Dental Center last February, I had no idea how important social media could and would be to my husband’s business. I agreed to help with our office marketing as one aspect of my newly created role at Pike Lake Dental Center. Part of the office marketing included our social media presence. Where do we begin to navigate in this cyber world? After doing a lot of online research and reading some great social media marketing books, I felt I was ready to begin. 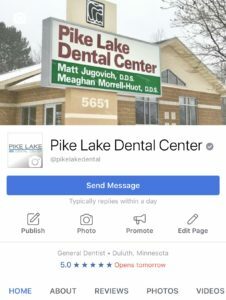 Facebook seemed the obvious place to start since we already had an account established for Pike Lake Dental Center. Up to that point, we had loosely posted a few things on Facebook. 239 people liked and followed our business on Facebook in April of 2017. That was a great start, but I didn’t feel like we had even begun to scratch the surface of Facebook’s potential for our business. Today, at 700+ likes and followers, I still feel as though we have a long way to go. What do people really want to see about a dental office on Facebook? How can we educate patients, share what we do and who we are, while still having fun? A mobile view of our Facebook page. I was – and still am – a firm believer in not over-posting (my personal definition of over-posting: posting more than twice a day) and not over-sharing (my personal definition of over-sharing: sharing everyone else’s posts, usually multiple times a day) on Facebook. Personally, if I didn’t have something fairly important to share with my friends and family, I would abstain from posting at all. Sometimes my personal life was so unexciting that I wouldn’t post anything on my Facebook page for many days in a row. I liked to keep my personal posts fresh and new and informative (so my friends wouldn’t think I was totally boring) while still staying true to the authentic me. I decided to apply that same rule of thought to our office’s Facebook account. 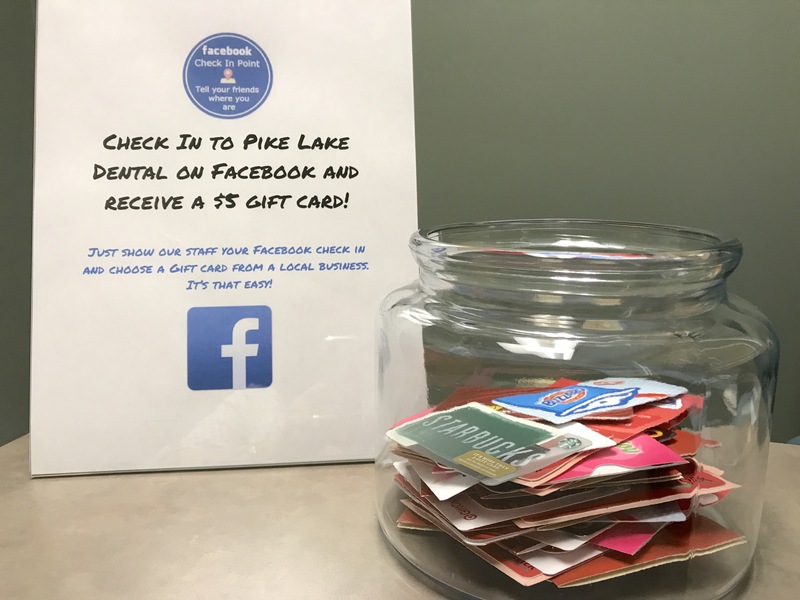 Pike Lake Dental Center’s Facebook page has definitely evolved in the past 12 months. It’s been a constant trial and error experiment finding out what works and what doesn’t. Does reposting other people’s content engage our followers? Not really. Does posting a picture of our staff lunch attract likes and comments from our followers? Absolutely! Do we always strive to stay true to who we really are as a small business in northern Minnesota? Without a doubt. I’ve found that people want to get to know our staff better. People want to learn about what we do everyday. Our Facebook followers want to feel as though they are part of our everyday interactions – that they are a part of our office every single day. And you know what? They are! They celebrate staff birthdays with us. They participate in contests with us. They learn about new and amazing pieces of equipment we use in our office. They share their personal interactions with our office with their friends. They are part of who Pike Lake Dental Center is every single day. We run a pretty high-tech office and are proud of the cutting-edge technology we offer. We are professional and pretty awesome at what we do. We appreciate and value our patients. We LOVE food, especially treats and birthday lunches. Lisa with her birthday flowers. So we share those things on our Facebook page. 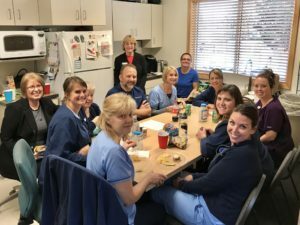 I think sharing the true “us” makes every one of us at Pike Lake Dental Center a little more human to our patients and our Facebook followers. By boosting posts (paying Facebook to promote a post to an audience or demographic we select) we can reach thousands of people. Facebook is also a great compliment to our website. We are able to post links directly to our website. I especially think the links to our blog posts are beneficial tools. My heartfelt conclusion: Facebook has positively impacted our entire office. As I sit at the desk I share with my husband at the office, I get to hear bits of conversations from our staff and patients. Almost daily someone mentions something they’ve seen on Facebook and comments or asks questions about it. That is a huge reward! The fact that we are growing every single week in Facebook likes and followers is my personal little pat on the back. We especially love when people like and comment on our posts. It’s so fun to connect with people on Facebook! I’m sure Facebook will eventually become less popular and a new social media platform will attract our attention, but until then I’d love to invite you to be a part of our office by following us on Facebook. See what we do, who we are and what we are all about at Pike Lake Dental Center. You might learn something, you might win something, you might even laugh a little bit. I have enjoyed haveing Pike Lake Dental as being my dental service. I’m sure it time to get checked out. My wife Lee also enjoys your service.